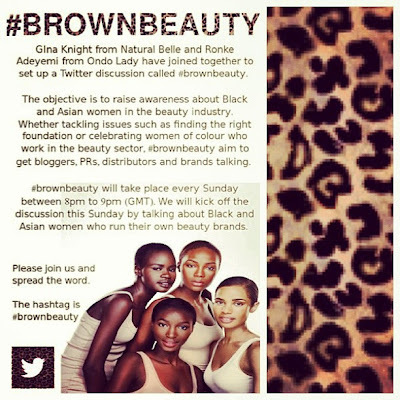 Last night on twitter @naturalbelle and @ondolady, launched the first ever #brownbeauty chat. It was great opportunity for women of colour to discuss the beauty industry from our perspective, and personally I felt it was a big success. At times it was a struggle to keep track of the topic but I don't think anyone really minded. I think we were all quite happy to have a little rant in some cases, whilst raising some really valid points in others. Some of the women I spoke with in the chat felt that beauty boxes were 'dead' because their quality begins decline after the first few boxes. I felt @sugarkinesis deserved props for her suggestion of a "graze-box"method for beauty boxes, where you log on and select the items you want to receive in your box. What's your opinion on beauty boxes? There are a lot of women out there who are un-aware of black owned businesses, including myself. I know the black owned hair businesses but when it comes to beauty, I wouldn't have a clue. A lot of the small business owners who took part in the chat agreed that word of mouth is often how they get most of their business, hence the work of bloggers and social networking is crucial to them. In addition to this a very important point was raised about us as consumers. Do we do enough to support black businesses, especially here in Britain? Why do British companies often see success in America before they gain support from consumers at home? The other big issue relating to small businesses was company professionalism vs consumer expectations. Are small businesses lacking support due to a lack of professionalism, or do we as consumers sometimes expect too much? This was one of the spin off topics that seemed to come about - a debate as to whether Bloggers should ask companies for products to try. I haven't done so yet, but it's not something I'd see a problem with. What do you think? I think the next #brownbeauty chat will be same time same place - Sunday 8-9pm on twitter. Just use the hashtag #brownbeauty to join in. 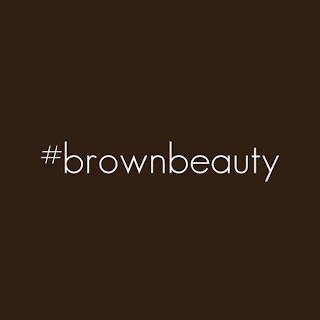 I'd love to know what your thoughts on the #brownbeauty debate. I've yet to delve into the realms of beauty blogging (make-up and skin care) as opposed to strictly natural hair, but #50ShadesOfBeige tag that's been floating around had my attention immediately, and after a chat with Gina, last week I agree that there is definitely a need for more beauty bloggers of colour; so maybe look out for a few posts of a new kind, soon. Thanks for sharing this lovely article. Will definitely be joining the next chat. I don't think there's a problem with asking companies for products to try. I've done it before with no problem. As long as it's for your blog and you're genuinely interested in the product and you're not just doing it to get freebies then it's fine.